Healthy Living with Patti Green: How Feng Shui Changed the Flow in My New Home! Healthy Living's Patti Green and I worked together on her new condo in Florida to add a little positive feng shui and make the space a beautiful and nourishing space for Patti and her husband. Check out what we did! Patti wrote an article and we did a radio interview. Welcome to Healthy Living with Patti Green. Get the latest on health, fitness, beauty and fun as Patti and her guest share simple tips, ideas and valuable insight to motivate you to live life to its fullest. 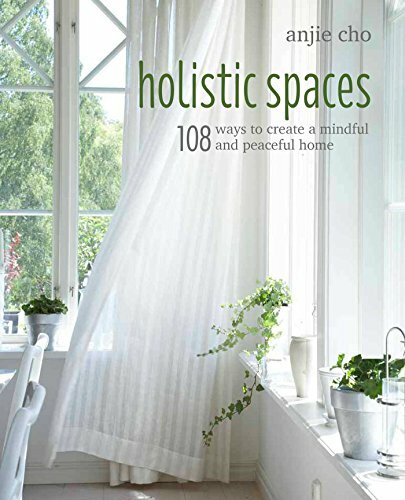 PG: Today I’m delighted to welcome Anjie Cho, who’s a registered architect, Feng Shui interior designer and bestselling author of 108 Ways to Create Holistic Spaces, Feng Shui and Green Design for Healing and Organic Homes. Since 1999, she’s been creating beautiful and nourishing environments throughout New York City, Washington D.C., San Francisco, Los Angeles and beyond. Anjie, welcome to my show. AC: Hi Patti, thank you so much for having me. Thank you for coming! I’m so excited that you’re here. I’ve always been so inspired by the ancient art of Feng Shui and I’d love it if you could share with the audience, what is Feng Shui all about? Feng Shui is an ancient art of placement that was developed in China, although all cultures have some form of Feng Shui where they look at how to position themselves in the most positive way within their environment. Feng Shui just happens to come from China, and it looks at how to locate pieces of furniture in your home to achieve the best flow. That’s on a very, maybe superficial, level but on a deeper level, it’s really about being able to see your environment as a metaphor for your life and being able to realize that your environment represents your life and you can make small changes within your environment that will create a small shift and positive shifts in the direction that you want your life to go. So essentially Feng Shui can be architecturally, it could be interior design, but people can also Feng Shui to improve and enhance the way money flows in to their income stream and/or they can Feng Shui aspects of their relationship to be improved. Is that true? Yes, absolutely. There’s many different aspects of life that Feng Shui can affect like money, wealth and relationships and health, also your knowledge, your career, your children, your ancestors… Almost anything in your life, you can look at how to improve it with Feng Shui. With you being a number one architect on national scale, you’ve actually adopted Feng Shui as a very big part of your practice, and today, just for simplicity’s sakes, we’re going to give our audience 5 simple tips to Feng Shui your home without having to do any renovation. So basically with these tips that we can incorporate, people can add these to make real shifts in the way the space makes them feel. Yes, because I think a lot of people think, “Oh, I can’t move anything around, I can’t move out wall or have a rental or I don’t have enough money to do renovation,” but there’s so much that you can do without renovating, so I wanted to share with you some of those tips today. What would be one of the tips that you’d like to share with everybody? One great tip is to add a wood element to your space. The wood element relates to how flexible you are in life. It relates to growth. So we talked about relationships and money, so you could think of it as growth in your income or growth in your career or growth in your relationship. The wood element, if you think of wood, you could think of plants or trees, the wood element relates to flexibility, to growth, and also it’s very healing and generates human heartedness and kindness. One easy way to add wood element to your home is with green plants. Now, ideally you want living green plants but you could also add some fake plants or silk plants as long as they’re a very good quality, very realistic and they look great. Patti and I were talking about this last time we spoke, and, for instance, if you have a home that you’re not at all the time, like a summer home, you’re not able to keep up with watering these plants all the time, or if you have, say an apartment, that doesn’t get a lot of sunlight or there’s an area in your home that doesn’t get a lot of sunlight, you can absolutely use a fake plant. I think a fake plant is better than a dead plant. No, I’m sure. Now, when you say a wood element, I mean, it might sound simple but can someone just add a piece of wood? Wood is a little bit different actually, and it depends on the different Feng Shui consultants, and I support all different schools of Feng Shui. What I’ve been taught by my teachers is that like a piece of wood, a brown piece of wood, is more related to the earth element because its color is brown, and it’s also deadwood. But some people would say, yes, it’s wood but to me, I think the most effective way to add the wood element would be to add a living green plant or something green. There’s something that you learn from having a living green plant. You have to take care of it. You have to pay attention to it. I had one in the corner of my house, and my husband and I forgot about it for a couple of weeks, and all the leaves died. So it does cultivate this mindfulness and teach you how to take care of something other than yourself and to be aware of your environment, so it works on many different levels. Okay. So adding a wood element, which would basically be a living green plant or a very high quality fake silk arrangement, flowers and/or tree, that you would place anywhere in your home, or does it make a difference where? It really depends on what you want to work on. To keep this interview simple, I would say that you could put one in your entry, one in your bedroom and one in your kitchen. I love it. Alright, so what’s the next tip? Another tip would be to brighten your entry, the entry of your home, because your entry represents your head or your face to the world. It also represents how opportunities come to you. A great way to brighten your entry is to, one take a look at your bulb. Make sure it’s not burned out, or it might be a really low wattage. I would encourage people to replace their light bulbs in their entries to higher wattage, so you have the ability to keep your entry very bright so that opportunities can find you. The light bulb also represents fire energy, so it adds more fire, passion and recognition. If you’re in a dark room and someone lit a match, you would be drawn to that and you would see it. That’s kind of that energy that you create in your entry and then attracting opportunities towards you by getting a new bright light bulb and having a bright entry. I love it. Now is the entry way in a vestibule inside or an entry way that would be a light that people would see on the outside? Alright, we can do that. And then tell us the third tip. The third tip would be looking at your chairs in whatever room you happen to have your TV. Most people have their TV in their family room, and usually, you have all your seating in the room facing the TV to watch TV, but it also makes sense to have some seating that doesn’t face the TV, and that inspires conversation and connection. So just take a look in to how all your chairs are arranged. If they’re all facing the TV, it doesn’t inspire connection, family, it doesn’t really inspire you. It’s more about staring at the TV, right? So I would encourage people to look at how their family room is set up, because it’s a family room! You want to spend time together, and maybe just move a couple of chairs around so they’re not all facing the TV. Yeah, that one’s pretty easy, and it will really help support your relationships in your home. It makes a lot of sense. I know that we’ve got one of those sectional couches, but it all faces the television and it doesn’t really inspire much conversation. But we do have another seating area that’s sort of centered around the coffee table, and it does inspire conversation and connection. I’m definitely going to try to add a piece of furniture in the main TV room just to add that element. I think that that’s really important. I think so too, because how you position yourself in an environment really does matter. When you’re sitting on a bus side by side, you’re not facing each other, you actually feel very comfortable sitting close to someone, right? If someone was facing you, you could be further away, but that inspires conversation and eye contact, so it creates this different dynamics between the person. So you want to create situations in your home where you inspire relationship and cultivate them, rather than cultivate silence and disconnect. The fourth tip would be to look under your bed at what storage you have. Your bed is really important. It represents you, and it’s great to have space under the bed if possible. That means not to have any storage under the bed, because it may represent unconscious blocks in your life. So if you have to have some storage under your bed, the best things to store would be any soft items such as blankets or pillows, things that are bed related, linens, and avoid anything like old love letters from an ex or anything sharp. You don’t want anything negative, because you’re sleeping over that energy, and it affects you while you’re passively sleeping. That’s kind of cool. I would never have thought of that but, in thinking now in my mother’s home, where she used to live, she had these storage bins full of these books and all this old stuff. They designed these tubs, these plastic tubs, to specifically go under the bed, they’re pretty shallow! But currently in my home, I have nothing under the bed so I’m feeling safe. What’s the fifth? The fifth tip I have is to look around your home and see if you have any broken objects. For instance, I had a client who had this broken lamp that she had in her home for a long time, and she always meant to repair it but she never got around to it. When you have these objects in your home that are broken or need a repair, it’s a really good idea to either just get it repaired or to let it go. Give it away or toss it, because it can represent stuck or broken energy. For me, if I saw like this lamp that I meant to fix in my house every day, it’d be a constant source of a little bit of guilt like, “I should do that. When am I going to get time to do that?” It just weighs you down all the time to have that there, and we have enough things to do in our lives. We don’t really have to add more to our lists, like repairing a lamp, so either repair it or let it go. Okay, that’s an inexpensive fix as well. I know when speaking to you, I told you about our sort of winter home, if you will, and it’s just a condo, nothing exciting, nothing big, and you’ve given me some tips of what I can do to enhance this space and basically Feng Shui it for better energy. In my blog that we give the interview going live, I’ll share with you how things have shifted in our lives with the wood element that I’m going to be adding, the brightened entry way with a new lighting, adding the chairs to the family room. I don’t have anything under my bed, so I can’t do that and I’m going to check around for any broken objects, yet, I don’t think I have any, but we bought this from somebody else, there could be something I’m not even catching. So I’m going to do a full walkabout and then report back. Ooh, I can’t wait to see the blog post. I know, I can’t either. Now Anjie, you do have another element to your practice, and if you just go in to it briefly. “Green” is such a big word now, everyone wants to save the environment and people are trying to recycle and repurpose. Is that would green design is about, or what is it all about with how it relates to architecture and Feng Shui design? In architecture, green design is a very broad term. It could incorporate looking at sustainable building materials and go so far as to look at how you dispose of building debris and also the lifecycle of things or how the air quality is in the space, and it could go really into depth. I think on the easiest level, I like to work for my clients on the very simple level as to how to incorporate green living practices to their home, because when you teach people small things that they can incorporate in to their lives that include green living, then they begin to see the connection to everything, and this is also how Feng Shui is related too. I think Feng Shui is the original green design, because it really looks at how does your environment affect you, and how do you affect your environment? This is the same thing with green design. I like to teach people about simple things like, how do you cut out toxic cleaning products from your life? Or how do you incorporate recycling in to your everyday life? Then they may start to get more interested and start composting and make bigger changes, and then, hopefully (there are clients that I have that would prefer to use more sustainable materials, such as bamboo plywood, which is rapidly renewable and grows faster) maybe using reclaimed materials instead of new materials. But sadly, a lot of times in construction, it’s actually more cost effective and time effective to use new materials, and sometimes it’s almost impossible to try to renew something, so I do my best, but I think it’s about small stuff. I love it. I mean, basically, people can make small incremental steps. Just like you said, composting and/or recycling, that’s simple. Changing their toxic cleaning materials to more green. Those are great ideas, but then also breaking it down to, if someone’s building out a space, maybe speaking to their architect or builder about certain sustainable types of materials that they might be able to incorporate that can sort of save our planet, if you will. Okay. Well, Anjie, I know that you’re a very sought after expert in the fields of Feng Shui and green living, and I thank you so much for being in our show today. Thank you so much Patti, it was so much fun. It’s been great and I’ll report back.